Mono-metal bullets have a few advantages (a couple of disadvantages too) over typical non-expanding hard cast bullets. These advantages may or may not be meaningful to each individual, depending on your usage. The advantages are that they are cleaner burning/firing than hard cast bullets. Also, hard cast bullets can smear their nose profile when they hit large bones at close range/high velocity. When the flat nose smears and changes shape, it can impact straight line penetration. 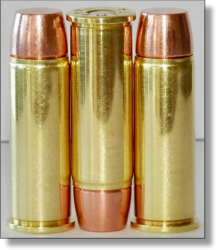 The disadvantages are cost and case capacity issues……..mono-metal bullets made of copper or brass alloys are lightweight for their length. As an example, the 380 gr. bullet used in our DG 45-70 load is as long as a 500+ gr. hard cast bullet, depending on its alloy. This means that (for example) the 45-70 casing, with its limited capacity, will have much less propellant capacity when this long bullet is seated into it, so with this limited powder/case capacity, we have to get creative in choosing a propellant that will give us the velocity we need, but not burn so fast as to raise pressures beyond 43,000 PSI. The case capacity issues become more complex with casings that are much smaller than 45-70 like say a 44 Mag. casing. Lead-based bullets are heavy for their length and generally allow for much more case/propellant capacity. 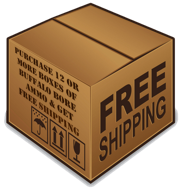 By choosing correct propellants, we can generally get great velocity from the long-for-weight mono-metal bullets. We’ve long ago learned that flat nosed, lightweight, mono-metal bullets penetrate far deeper (in a straight line too) than the typical lead-based bullet of similar weight—FAR DEEPER! This is strictly a personal taste/belief issue, but I’ve never been a fan of using the 44 mag. as a dangerous game cartridge when fired from most revolvers………(rifles are a different story) it simply lacks the bullet diameter, velocity and basic punch to qualify in my mind, although with proper design in the ammunition, many folks have used the 44 Mag., fired from revolvers, to kill some very large bovine, bears, moose, etc. 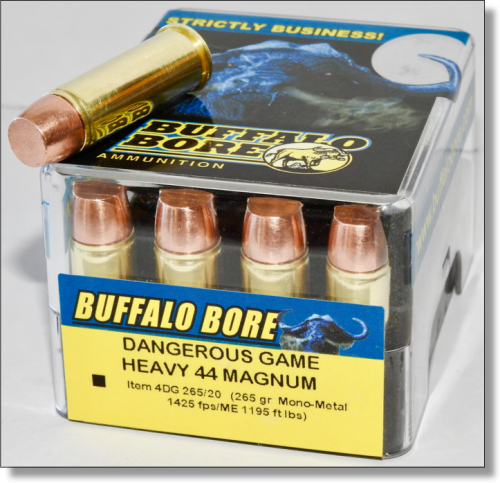 Our Items 4A and 4D have filled this “Dangerous Game” requirement/role for the 44 Mag. for decades and have filled it well. Still, unless a good 44 Mag. revolver was all I had, I’d step up to at least a 454 Casull, again with ammo that is purpose designed. This new Dangerous Game Mono-Metal load will fill the same mission as our Items 4A and 4D, but with a cleaner firing Mono-Metal bullet. Of course, these Mono-Metal bullets contain no lead, so they qualify as legal for states that do not allow lead-based ammunition to be used. If you’ve followed my writings or practices for very long, you know that I do not believe in the industry wide duplicitous practice of using extra-long barreled laboratory test barrels to establish our advertised velocities. These types of industry practices generate false high velocities that a person would never get for an actual firearm made for field use. Instead, we use real firearms. Below see the velocities we obtained with our firearms with this new DG 44 Mag. load. To keep folks from speculation (no, folks would never do that regarding guns 😊) you’ll note that the 18-inch carbine generates only 225 fps more velocity than the 5.5-inch revolver……..Most of our full power 44 Mag. loads will see a 400+ fps gain over a revolver, when fired from a carbine, but with these very long mono-metal bullets, we have to utilize a faster burning powder to make up for how much case capacity that bullet uses……..this faster propellant does not take as much advantage of the longer barreled carbine as the typical type of propellant we’d use for a shorter lead-based bullet. Still, the shoulder mounted rifle has many advantages over a revolver, one of them being that it is shoulder mounted and easier to shoot with greater PRACTICAL accuracy, but that extra velocity is still a nice gain. We run this load as hard as we can for it to still be safe to fire in all firearms thusly chambered. We want it to be a true Dangerous Game load, so watering it down was never considered. This means that unless you have smooth chamber walls, you may experience sticky extraction of the fired casings. None of my test guns experienced sticky extraction, but folks, I’ve been selling high end (on the power and quality scale) ammunition to the American shooting public for decades and I promise you that far too many of today’s mass produced firearms come directly from the factory with tooling marks (roughness) inside the chambers. Please read the linked article below in order to understand. If you experience sticky extraction of fired casings with this ammo, it is NOT the ammo, but it is the combination of high powered ammo along with your not-so-smooth chamber walls. The article explains how to correct the situation. Please enjoy this new Dangerous Game 44 Mag. load. If you use it to save human lives, please send us a picture and paragraph for inclusion on our site. Have fun and stay safe.